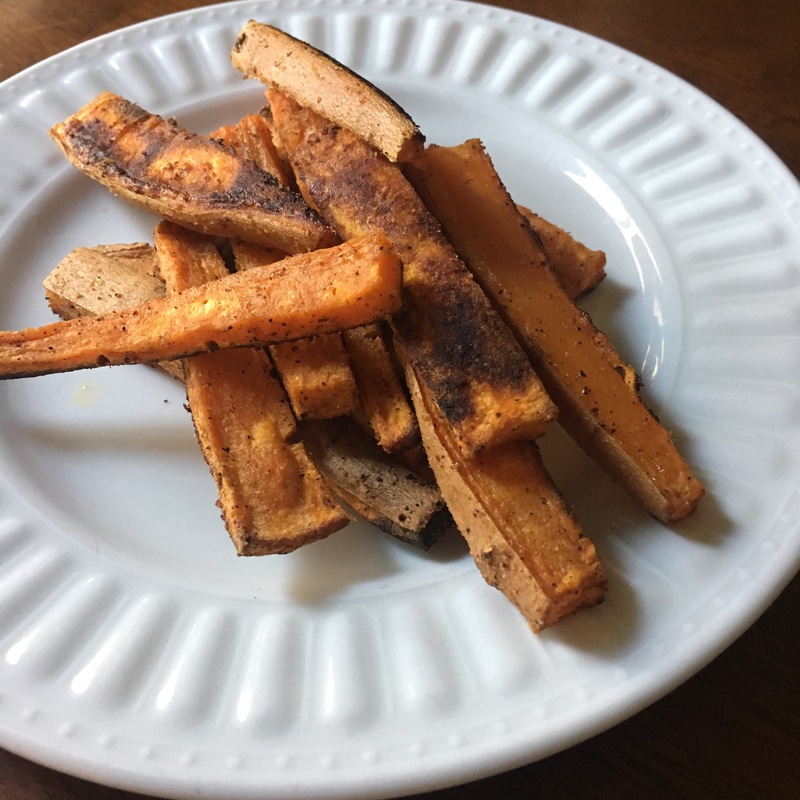 Yam fries are currently my favorite side dish and snack. I’ll usually make a double batch of these babies and use a portion to go with whatever I’m making for dinner that night and use the rest to snack on in the coming days. They taste great served hot or cold straight out of the fridge! Really! This recipe is a DG creation. In a large bowl, mix together the olive oil, pepper, garlic powder, nutmeg and a sprinkle of cayenne pepper. (Use more or less according to your personal preference). Toss the yam fries into the olive oil mixture and coat evenly. Transfer to a large cookie sheet in a single layer making sure that the skin side is up. Sprinkle with salt upon removing from the oven. Ten years ago, I took up running. I’ll never forget my very first attempt. I told myself “I’ll start small”, and I did. I mapped out a route that was less than one mile in distance which would lead me straight to my sisters front door. It would be perfect! I would stop for water and visit for a few and then I would walk back home to cool down. That very cold morning, I laced up my old pair of New Balance tennis shoes (which were absolutely not running shoes! ), I put in my ear buds and pressed play on my iPod Nano (remember those?!). I didn’t bother to take the time to warm up, I just RAN. At pretty much a full sprinting pace! We lived in a neighborhood where each morning the sidewalks hosted its regulars who went out for their morning strolls, runs, bike rides and what not. I was determined, that one day soon, I would be one of those regulars. As the song “Cyclone” by Baby Bash pounded in my ears, my feet hit the pavement trying to keep up with the beat. It took me approximately a half of a block to realize that…running ain’t easy!!! And I have absolutely no idea what I’m doing!!! I continued to sprint and walk, sprint and walk, until I found myself on my sisters front lawn. I spent what seemed like ten full minutes coughing, or perhaps a more accurate description would be “barking” and dry heaving. After that, I laid on my sisters bed and cried real tears because my ears and teeth hurt sooo bad! It’s for this very reason that the song “Cyclone” by Baby Bash will always be a favorite running song of mine. So when the song came on the other morning as my grandma was getting into my car, I did the opposite of what most good granddaughters would do, and I turned the volume UP! As we drove away from her house, I asked “do you like this song grandma?”. Her response was “I don’t know it, but I really like the beat!”. I have one of the coolest grandmas ever! Cut each thigh into strips, 1 1/2 inces thick. Combine soy sauce, brown sugar, oil, garlic, and chili garlic sauce in a medium sized bowl. Reserve 1/3 C of sauce and set aside. Marinate the sliced chicken in the remaining sauce for at least one hour. Cover and refrigerate. 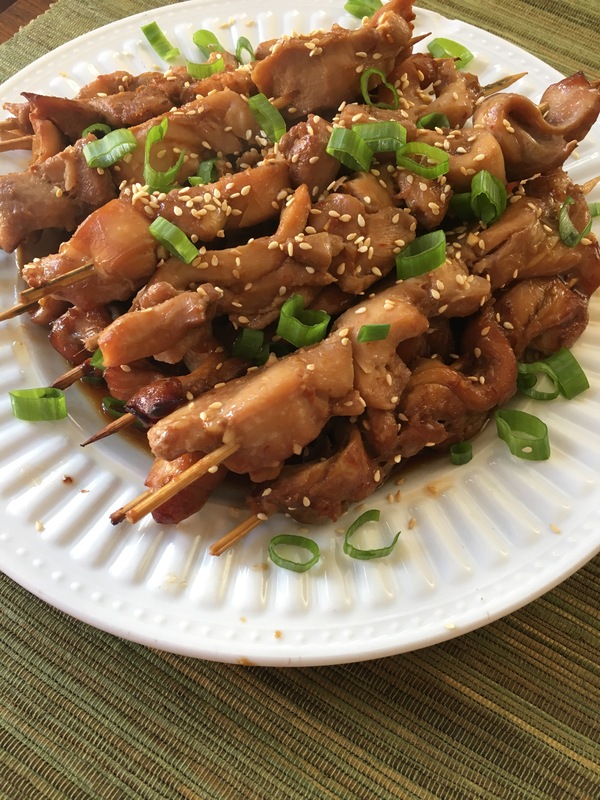 Thread the chicken onto wooden skewers, you may need to cut the skewers short enough so that they will lay flat on the bottom of the crockpot. Pour the remaining marinate onto the skewers. Cover and cook on LOW for 2 hours. Turn the skewers over and cook for another hour. Remove skewers and place on a platter. Discard the cooking liquid and spoon the reserve sauce ontop of the skewers. Sprinkle with sliced scallions and sesame seeds.